At the MGM Cotai Casino and Resort, the company’s second integrated casino, hotel and entertainment center in Macau, China, the heart of the complex is an innovative, multi-dimensional sensory experience called the Spectacle. Housed in a vast atrium space, the Spectacle features an immense LED canvas composed of 25 LED walls towering more than four storys high and spanning the length of a soccer field. The LED displays, comprised of differently-shaped screens set at various levels, form a horizontal wall under a column-free ‘diagrid’ structure. The Spectacle is programmed with digital art showcasing the beauties of China and the natural wonders of Asia. The screens can also operate in live mode to capture events happening within the atrium. Integrator Design Consulting Group forged a close collaboration among stakeholders Electrosonic, Smart Monkeys, Analog Way and other manufacturers to ensure the success of the Spectacle’s AV control system and LED walls. The project is the largest single integrated system delivered to date by Analog Way, which supplied 20 LiveCore Ascender 32 switches to drive a collective 80 2K outputs managing all of the Spectacle’s LED displays with a capacity of up to 176 megapixels. 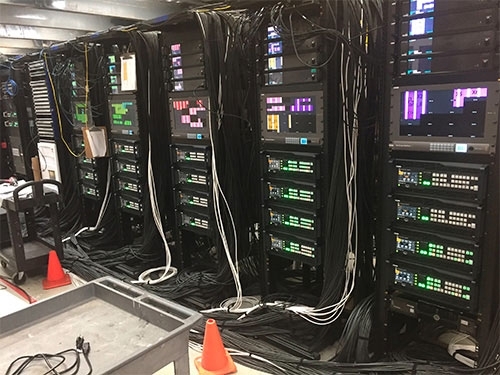 The Spectacle has more than 13 times more outputs than the impressive Comcast Experience in Philadelphia and is five times larger than the mammoth 20 Times Square (New York) 8K x 4K screen; both of these projects also utilize Ascender switches. The solid reliability of Analog Way’s LiveCore platform and its seamless integration with the Spectacle’s fleet of equipment was an ideal solution for the head-turning new space at MGM Cotai. Analog Way was involved throughout the process from design assistance and periodic design reviews to working closely with the on-site team to deploy the control system and provide training for MGM’s on-site technicians.